This beautiful gift perfectly captures the joyous spirit of the holiday season. For those who are looking for an impressive Holiday gift that has a little bit of everything, this is it! Our Holiday Spirit is filled with sweet and savoury morsels great to accompany the BCVQA wine included in the overflowing wooden chest. We have added: Holiday espresso chocolate by Urge chocolates, a tin of Christmas wafer rolls by Dolcetto, Hardbite chips, Cafe Dream cookies, smoked salmon pate by Seachange, Hedgehog chocolates, peanut brittle by Sweetshmith, chocolate truffles, Italian ladyfingers, peanuts, mixed nuts by Parker & Paisley, Partners crackers and Candy Cane Caramels by Rogers Chocolates. As with all our baskets, the Christmas Spirit gift basket is beautifully wrapped in cello with a hand tied bow and includes a gift card with your message. 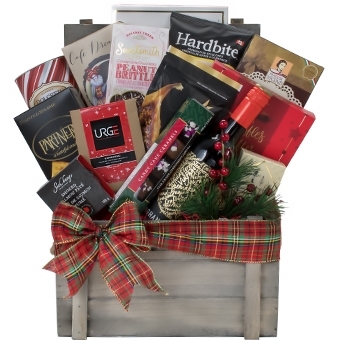 All gift baskets on www.pacificbasketco.com are exclusively designed and made by Pacific Basket Company.